Today the Raise Hope for Congo campaign released a new campaign video, “Conflict Gold 101.” The video outlines the details of Congo’s conflict gold trade and puts the spotlight on jewelry companies who can play a role in reforming this deadly trade. The trade in conflict minerals—gold, tin, tungsten, and tantalum—is one of the primary drivers of violence in eastern Congo. Gold has emerged as the most lucrative conflict mineral because it is easy to smuggle small quantities for large profits. More than $600 million in gold is estimated to leave Congo annually, and fighting in and around gold mines continues, especially as armed groups allied with the M23 rebels attempt to take control of mines and trading routes. Conflict gold mined at one of the 15 major mines across eastern Congo follows six steps in a supply chain until it reaches its final form: gold bars or jewelry. Addressing the trade in conflict gold is essential to finding a lasting solution to the ongoing war. 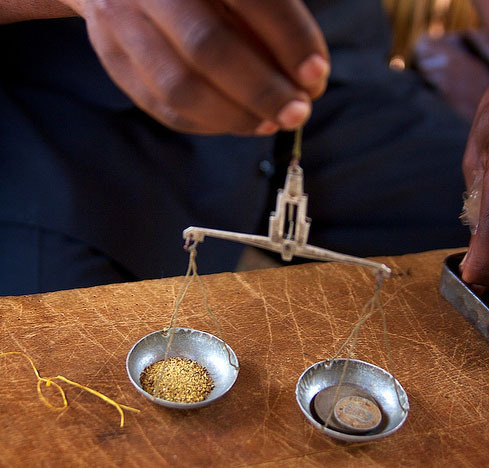 As the largest consumer of gold worldwide, jewelry companies can be part of the solution by proactively partnering with suppliers to source conflict-free gold from Congo. In addition, the Obama administration should take a leadership role in helping Congo and the region formalize the gold trade, and the U.S. government should work with the United Nations to sanction known gold smugglers in the region. With Valentine’s Day quickly approaching, it’s important to remember the origins of gold jewelry. To raise awareness about Congo’s conflict gold trade, share the Conflict Gold 101 video on Facebook and Twitter. For more information on Congo’s conflict gold trade, visit Raise Hope for Congo’s Conflict Gold page, where you can read the Conflict Gold 101 activist brief.